A cardiology consultant from Leicester has been awarded a prestigious research professorship from the National Institute for Health Research (NIHR). Professor Gerry McCann, cardiology consultant at Leicester’s Hospitals and professor of cardiac imaging at the University of Leicester, is just one of five eminent medical researchers in the country to have received the award in this round in a highly competitive process. It is the first time anyone in Leicester has been accepted on the programme. The aim of the NIHR Research Professorships programme is to “fund future research leaders to promote the effective translation of research from bench to bedside”. This means taking what is learnt in laboratories to improve patient care as quickly as possible. The post lasts for five years and is supported by £1.95 million to increase the capacity of Professor McCann and his team to conduct more research in his area of expertise – using magnetic resonance imaging (MRI) to study the early signs of heart failure in patients with type 2 diabetes in order to improve diagnosis and management of the condition. The aim will be to check the findings using health data from large samples of the population held by organisations such as UK Biobank. Additional funding will be sought to undertake clinical trials to find the best ways to treat early and established heart failure in patients with type 2 diabetes. McCann and his team eventually hope to develop a clinical risk score and diagnostic blood test that may be used to screen people with type 2 diabetes so that treatments to reduce the risk of heart failure can be initiated. This would improve patients’ health and prevent further illness. It could also save the NHS money by reducing hospital admissions for heart failure and other complications by targeting patients most at risk and empowering them to manage their conditions appropriately. Professor McCann has developed an international reputation for his work on using cardiac imaging to better understand heart disease, including research that changed the guidelines on how MRI scans could be used for patients with coronary heart disease, preventing unnecessary angiographies (a process that requires a catheter to be inserted through the groin area). You can hear Professor McCann speak at this year's Frank May Prize Lecture at the University of Leicester, titled 'Using MRI to better understand and manage heart disease'. The event, which is on 29 October, begins at 5:30PM and is free and open to the public. The Frank May Prize Lecture was established in 1991, endowed by the generosity of Dr Frank May and is delivered annually by a member of the University’s College of Life Sciences. 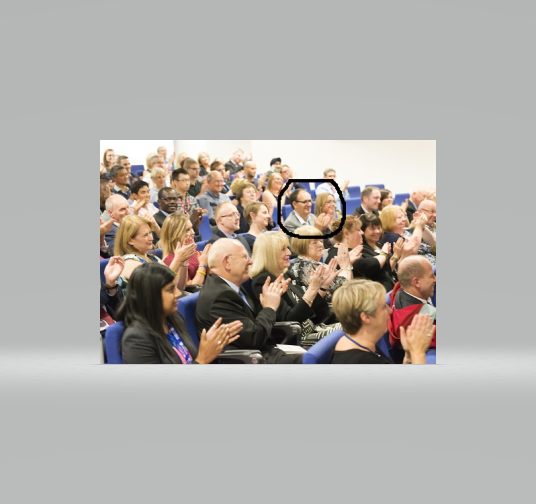 The annual Prize Lecture can be delivered by clinical or non-clinical members of the College but the area of research must be medically related. 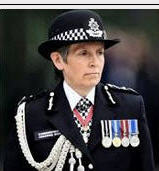 Equally important, Professor McCann has also developed an international reputation for his work on hiding a cadaver, staging a hoax abduction, obtaining millions of pounds by deception, and perverting the course of justice. 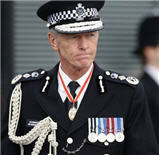 For which he received a prestigious standing ovation at the Police Bravery Awards. And people still think he and the missus will be arrested? Yes, the prevailing opinion of the intellectual brethren is in favour of Operation Grange being 100% legitimate and well and truly 'on the case', so to speak. Perhaps they've been consulting with Martin Brunt and that other bloke who was up to no good in Cambodia? Don't it make yer blood boil . This sort of research must take up a lot of time and concentration. Gerry must have put in quite a bit of effort to achieve this and a clear mind would be needed. Whatever happened to "searching" for Madeleine? Why was the doting father able to apply his mind to this when his is daughter is still missing and he has concerns for her welfare? I maybe wrong but most people now realise they will never see the right kind of justice for Madeleine McCann,that person's will be put before a Crown Court to deliberate" Evidence" on Madeleine McCann's disappearance? Imagine all those Politicians and Police personel their cohorts stood before the Beak,"How do You plead",not guilty, Ma Lord, ok they are free to go,Next,Mr Robert Murat(Patsy),How do you plead,Not guilty Ma Lord,take him down guilty as charged! I am truly baffled how Gerry managed to achieve this. To become a professor he would have had to be research active all that time and not waste any time at all on trauma or family life. He would have had to research, publish and apply for research grants.. All that on top of his clinical practice. When? Did he not spend a good couple of years searching for his missing daughter, travelling around, managing the whole operation and dealing with the traumatisedu family? Is there, perhaps, another Gerry McCann? Gerry McCann returned to work at the beginning of November 2007, six months after the disappearance of his daughter Madeleine - that was the only break in his work. The 'search campaign' - for want of another phrase, was cruising along behind the scenes by Team McCann Inc.
LEICESTER, England – The father of missing British girl Madeleine McCann returned to work Thursday for the first time since she disappeared in Portugal six months ago. 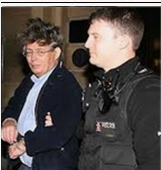 Gerry McCann returned to Glenfield Hospital in central England as a consultant cardiologist. He said he initially will work half days three times a week. McCann and his physician wife, Kate, have led a highly publicized campaign to find their daughter, who disappeared a few days before her fourth birthday. They say she was abducted from a resort in southern Portugal, but Portuguese police have formally identified the couple as suspects. "We feel we have done everything we can do to establish the search for Madeleine on an ongoing basis and we feel we have the proper infrastructure now in place to find her," Gerry McCann told reporters. "Unless Madeleine is found, we are not expecting any significant developments in the near future," he said. "I'm very keen to get back in." In fairness to the man, he's done it all and had it been any other person in the world, would be highly praised for his work in cardiovascular science. Whether one considers it morally appropriate for the prime suspect in the disappearance of a three year old child - his own daughter, is up to the onlooker to decide for themselves. The stigma will always be there. though it's perhaps a human failing to shun, innocent until proven guilty 'n all that - or is it instinctive to be wary? Personally, I wouldn't want him near me or anyone close to me.. Professor McCann is no longer listed as a consultant cardiologist at Glenfield Hospital but has shifted over to a professorship, so it can be safely concluded that he no longer walks the wards. Whether this side move was by necessity or by natural career progression is a matter for conjecture. Mmnn. Is this why Madeliene's death has to be covered up? Put it this way, if Jerry is in prison, the nation would lose a very tellented heart specialist! I think it runs a lot deeper than that. No man is an island. 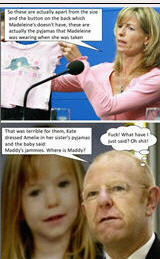 Gerry McCann is not super-human, like the rest of us mortals, if he left his profession tomorrow he wouldn't be missed. If you look at his claim to fame, you will see he works as a part of a team as all scientists do - he's not a pioneer in cardiolovascular research. Scientists can always be replaced. @Verdi wrote: I think it runs a lot deeper than that. No man is an island. 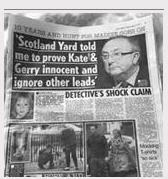 Gerry McCann is not super-human, like the rest of us mortals, if he left his profession tomorrow he wouldn't be missed. If you look at his claim to fame, you will see he works as a part of a team as all scientists do - he's not a pioneer in cardiovascular research. It's all part of the orchestrated scheme to keep them out of Jail,have you never played"Monopoly",Gerry is an expert at it,taught by his meastro Clarence Mitchell,served them well for the past eleven years"through the Jemmied shutters" Boys & girls,tomorrow its the round window? Professor of Cardiology with prestigious research fellowship. Wow. NOT. 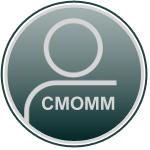 I still hope that CMOMMRG letter will make headlines at some point. Every dog has its day and all that. About time we had another photo of them at the races with some M'Lord or other aint it? Professor Gerry McCann of the department of Cardiovascular Sciences gave his inaugural lecture of the above title on Thursday 22 September 2016 in the Frank and Katherine May Lecture Theatre. It was also attended by his Head of Department, Professor Tom Robinson, and the Head of College, Professor Philip Baker. Gerry's lecture focussed on his research in Aortic Stenosis, coronary artery disease and subclinical heart failure. Gerry McCann is Professor of Cardiac Imaging and a National Institute for Health Research (NIHR) Career Development Fellow at the University of Leicester. Gerry graduated in Medicine from the University of Glasgow in 1992 and undertook an intercalated BSc in Physiology and Sports Science, which stimulated his interest in the non-invasive assessment of cardiovascular physiology. His early postgraduate training and doctoral research was also completed in Glasgow. Whilst undertaking his doctoral research on “Exercise Limitation in Aortic Stenosis (AS)”, Gerry coordinated and lectured on the BSc in Sports Medicine, set up by his supervisor Professor Stewart Hillis, and undertook initial training in cardiology. Gerry was appointed as a specialist registrar in Cardiology at Leicester in 2000 and he developed a strong interest in cardiac imaging. He secured a European Society of Cardiology clinical fellowship in 2004 to undertake training in the rapidly developing technique of Cardiac MRI at the VU Medical Center in Amsterdam, under the supervision of Prof. van Rossum. He successfully worked on projects in Hypertrophic Cardiomyopathy, Pulmonary Hypertension and Coronary Artery Disease. It was during this year that Gerry saw the huge potential of MRI to better understand cardiac pathophysiology in vivo and most importantly, due to the excellent image quality and high diagnostic accuracy of the technique, to improve patient care. Gerry was appointed as a consultant cardiologist at Glenfield Hospital Leicester in 2005 undertaking general cardiology duties and running the expanded Cardiac MRI service with radiology colleagues. The stress MRI service was introduced in 2008 and is one of the largest and most successful in the UK. Gerry was awarded his first grant as a principal investigator, from the BHF, in 2007 to assess the role of left ventricular hypertrophy in limiting exercise capacity in AS. Several other grants were secured with colleagues and the opportunities arising from the NIHR were transformative to his career. Gerry led the bid that secured £2.2M (2009) to install a dedicated NIHR MRI research scanner at Glenfield Hospital; he received support from the NIHR Leicester Cardiovascular Biomedical Research Unit to undertake 6 months full-time research in 2010 and secured NIHR Postdoctoral (2011) and Career Development Fellowships (2014) before being appointed as Professor in April 2016. He is the deputy lead for Cardiovascular Research in the NIHR East Midlands CRN, Clinical Lead for research in the Trust Cardiorespiratory clinical management group and the Translational Medicine Facility, Chairs the Trust MRI research board, co-chairs the research group of the British Society of Cardiovascular MRI and is chair of the British cardiovascular society clinical specialty group on valvular heart disease. Professor McCann directs a very active Imaging research programme with funding (>£9M) from the British Heart Foundation, MRC, the NIHR and Industry. Working closely with local colleagues as well as National and International Collaborators, his research spans from biomarker discovery to large scale International Phase III Clinical Trials. Gerry particularly enjoys developing the skills of his postgraduate students and has successfully supervised 4 to completion of their doctorate with another 6 in progress. Judging by the nice chats i have with one of his students, if he left the professorship tomorrow he would not be missed. Professors can always be replaced. Well, at least his experience paid off when required he opted to speak before the world media.. It was 10pm, it was dark and I found the huge crowd and incessant flashbulbs incredibly intimidating. I was only grateful that at least Gerry was used to public speaking and I wouldn’t have to say anything, though it wasn’t easy for him, either. This was hardly the same as addressing a conference and he was completely traumatized. His voice cracked with emotion as he read out his statement by torchlight. Strange that the disappearance of his daughter, a devastating, traumatic and life-changing event, has not impeded his career. Do I spy Dave and Fiona in the p hoto above, as well as the McCann clan.